Knitting, crocheting and burning down the kitchen. Sorry it has been so long between postings, but I guess I should have known June would be like this – I am on the road for such a big portion of the month and then am extremely busy the rest of the time. But now I am officially on vacation (well, kind of vacation, back in SD helping with the Miss South Dakota pageant) and I have some more time. 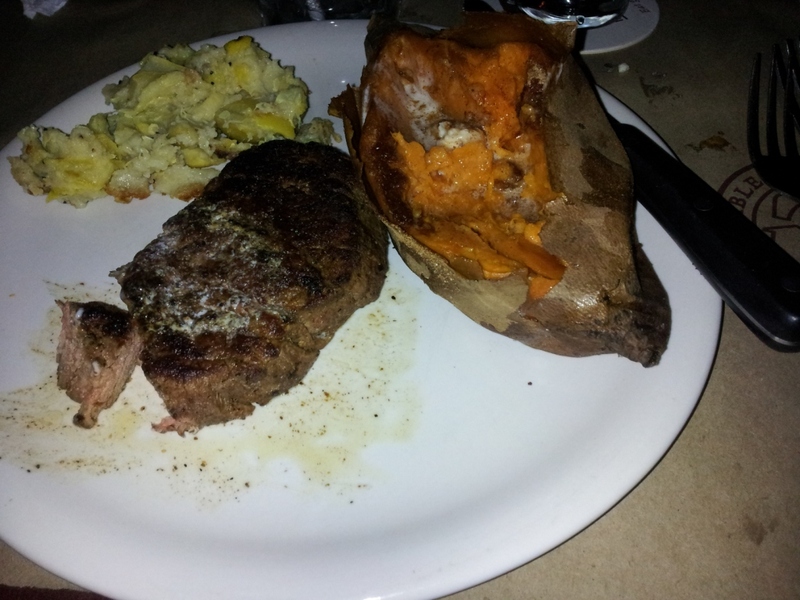 Here are some pics from Ted’s Montana Grill that I couldn’t access when I posted about it. It is making me hungry looking at them right now. Beef filet with baked sweet potato and summer squash casserole. 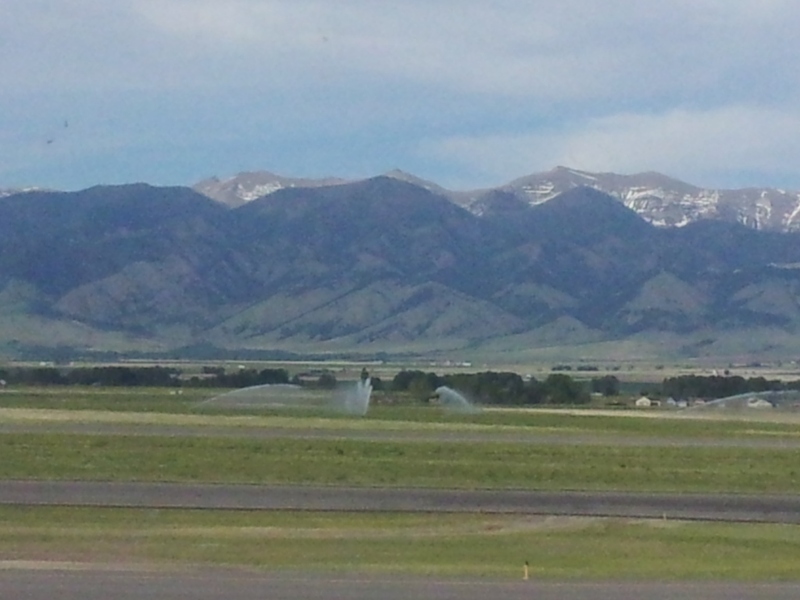 The view from the Bozeman airport is pretty nice. 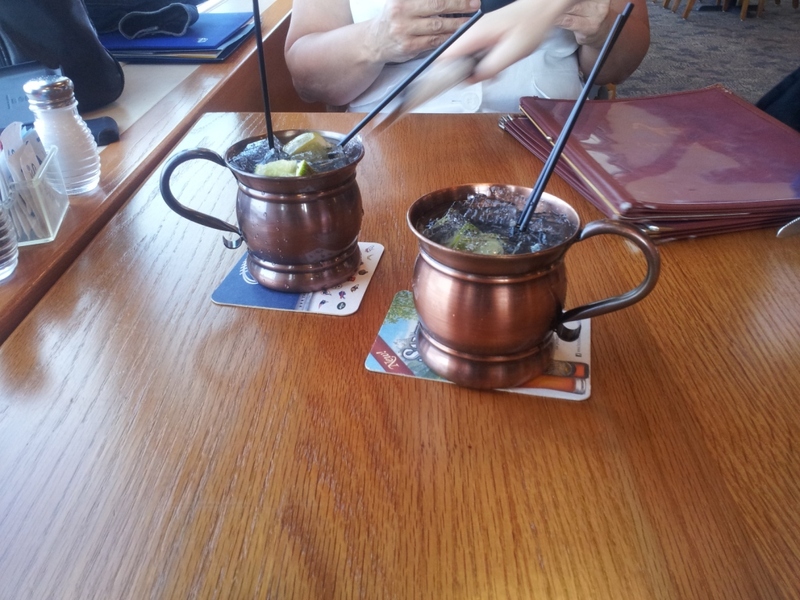 I was introduced to a new drink – the Moscow Mule. It is like a Dark and Stormy but is ginger beer and vodka instead of ginger beer and rum. Mmmmm. Apparently they are supposed to be served in a copper mug. At the Bozeman airport, you have to give them your credit card so you don’t walk off with the expensive mugs. The meetings in Bozeman (uh, weeks ago) went well and I arrived home at 10:30 to fall into bed and get up the next morning at 6:00 to meet my boss at 7:30 and drive out onto the eastern plains for a board meeting, which lasted from 9 until 4 and was mentally exhausting. I got home and told Ken I was NOT going to cook and where did he want to go for dinner. 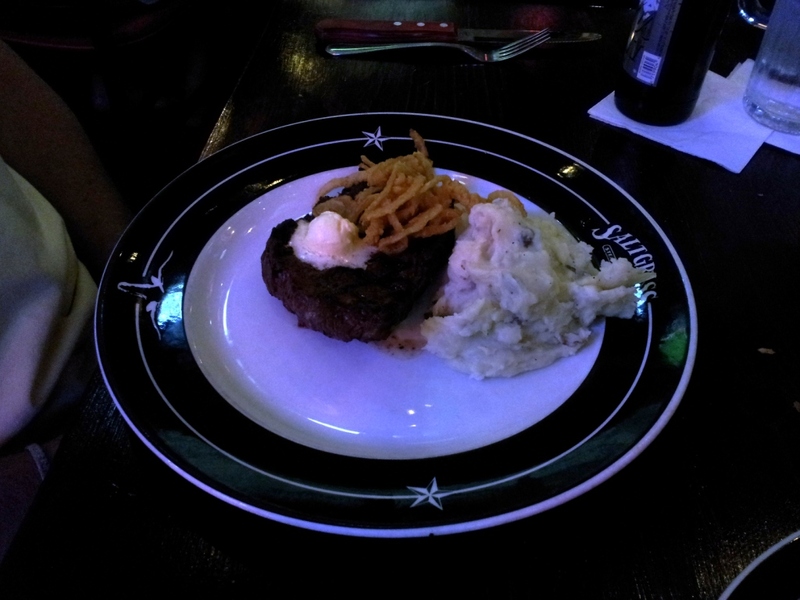 I was hungry for steak so we headed to Saltgrass Steakhouse, which isn’t far away. 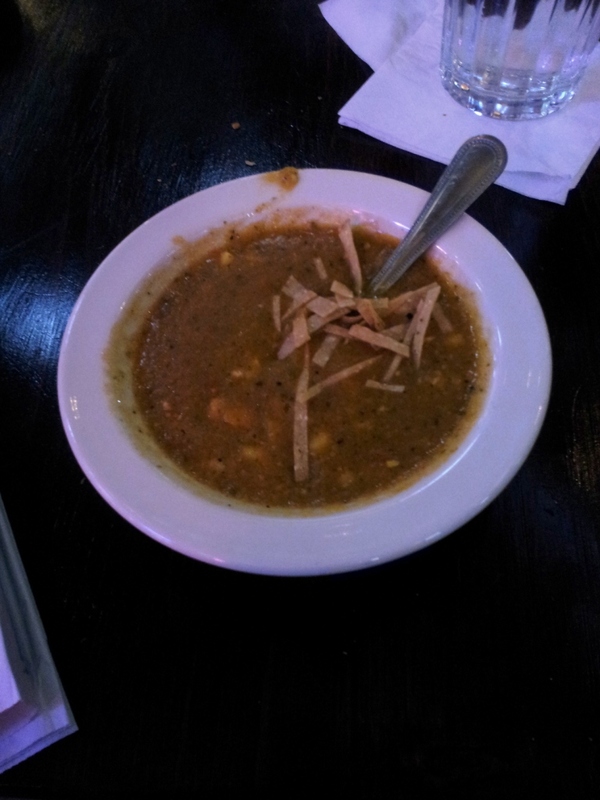 I had the tortilla soup (not really the type I like, too thick, but it was OK), baked potato, and shrimp and steak special. I did not know that BBQ shrimp involved them being deep fried with cream cheese and green onions inside the breading. 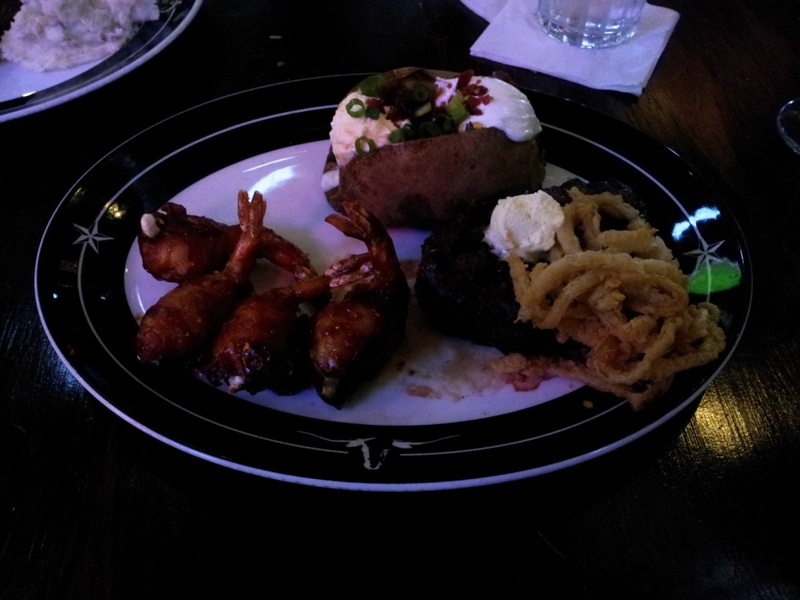 They were good, but it was all a little too much, and I brought home 2/3 of my steak and one shrimp and most of my potato. Ken had a salad, mashed potatoes, and the steak. 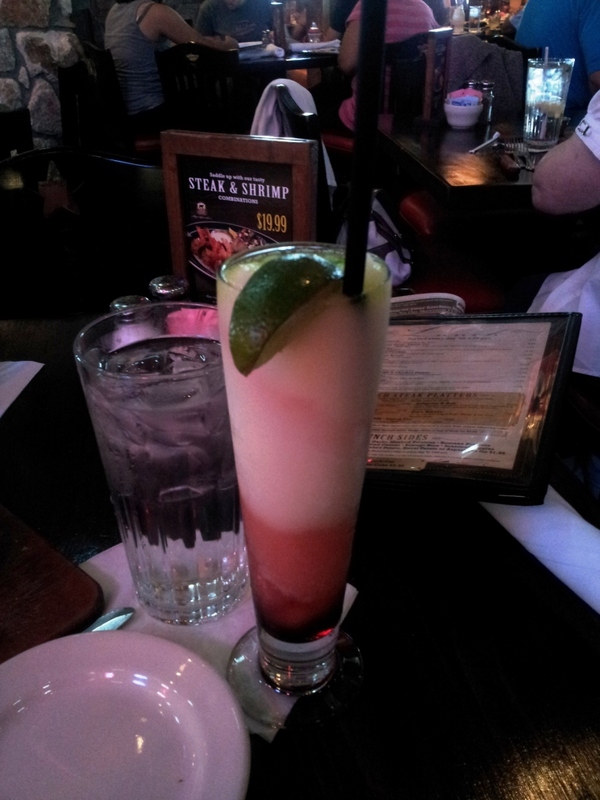 This was some sort of blended margarita that was excellent – I can’t find what it was called, but it was delicious. I had so brain cells left after the travelling and meetings that I didn’t think I should operate any power equipment including knitting needles and the washing machine, so I just took it easy the rest of the night, knowing there were big plans in the works (shopping with friends) for the next day. I got up the next morning and puttered, getting some things put away, talking to my niece on the phone and hearing about my lack of blogging. Then I got on the road for Kinko’s (now FedEx office) to get a visual aid for next week’s meetings printed out and mounted on foam core board, and to DSW to exchange a pair of shoes. I had been out shoe shopping the week before, in preparation for summer and the Miss SD pageant, and of course I decided I need to post them on the blog, so I said to Ken “I need you to take pictures of my feet.” His response: “You have no idea how many times a day I hear that.” Shoe pics will be along sometime this week. Another recent quote from the husband: “I love you honey, but you have stinky armpits.” Nothing but the romance at our house. This entry was posted in Restaurant reviews by glenderella. Bookmark the permalink.